The desert is a soothing place. There is comfort to be found in its solitude. Canada's only desert, the northern tip of the Sonora, just two hours drive from our home. The forbidding ochre cliffs of the Sinai. Just a few of my favorite things. Verbs not necessary for such still landscapes. I drove out of Tel Aviv in a foul mood. It didn't truly lift until I let out the air-conditioned chilled city air from my tightly-sealed Volvo. That was when I opened the window for the first time after a two-hour drive southeast into the Negev desert. 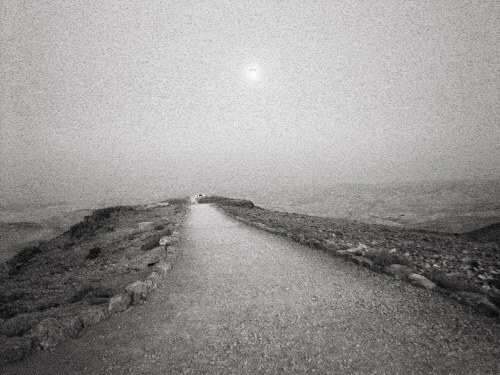 Suddenly, I was on a plateau overlooking the hardscrabble Negev as it plummeted downwards towards the Dead Sea. The sun had set an hour ago, so a fresh wind blew hard. 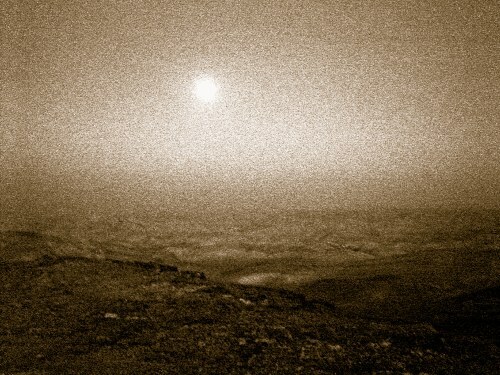 A near-full moon illuminated the awesome and desolate setting. Compared to the frenzy of life (and death) on Israel's roads, this was frighteningly calm. I had come here to do a story about an American Jewish family. They had decided to exercise their “right of return” under Israeli law, and immigrate to this country. By doing so, they became citizens overnight. American TV news organizations like to do stories about Americans in foreign places. It gives them an excuse to do international news features without scaring their viewers away with unfamiliar settings or unpronounceable names. I like to do stories about unusual people in unusual places, especially when that place is the desert. Here's the “hook” to this story: the devoutly Zionist Julian family from Brooklyn had finally decided to move to Israel after being invited -- by a Bedouin Arab tour guide they had befriended a year and a half ago. And they had decided to stay with Younis Abu Hamad until their apartment was ready in the nearby town of Arad. We couldn't afford to overnight a full camera crew to shoot a feature story so far from Tel Aviv. The volatile nature of daily news in this part of the world demands not being caught out of position when the big one happens. After all suicide bombs supersede stories of co-existence -- all good media-savvy terrorist organizations understand this fact. But I could certainly spend the night myself, and shoot my own footage until the crew joined me the next day to do the interviews. It had been a long time since I had turned on my camera. For the last seven weeks, I had been truly playing the role of the pampered network correspondent, entourage and all. But just as the change in scenery had boosted my spirits, so did shooting a story alone. It's that “zen” of solo TV journalism that I've repeatedly experienced during my six months on the road: joyous engagement in the physical act of newsgathering that gives momentum to the mechanics of the story. You're at one with the task at hand: focus, iris, white balance and shutter speed all changed manually as the subject requires. So I happily shot away as the large Julian and Abu Hamad families chatted in a room devoid of furniture in Younis' home. They all sat on the carpet, backs against the walls. Free-flowing Hebrew, Arabic, English and the occasional sign language meant the conversation would never stall. I had Younis warn me before he poured sweet, hot tea into his guests' glasses. I needed time to crawl over on my knees and get the low angle shot. It's hard to ask a Bedouin to actually think about such an instinctive act, after thousands of years of inbred hospitality. Still, I sensed that everyone had grown accustomed to this journalist interloper -- a peaceful, easy feeling that would disappear the next morning when the fearsomely-equipped camera crew arrived. Happily, I would have already captured the most intimate moments beforehand with my inconspicuous Sony PD-150. Yet, Arabs don't have the monopoly on superlative hospitality in this part of the world. By nature, I'm a suspicious world traveler. Nonetheless I don't hesitate to trust a stranger when I get the right feeling about that person. That happens more often than not in Israel. The Arad Inbar hotel was already shut down for the night when I got there at 12:45 a.m.. I rang the bell. A young Israeli with a thick Russian accent unlocked the door. He apologized for his poor English - he had only started studying the language the month before. I asked for a room and a 4:30 a.m. wakeup call, and gave him 300 shekels in cash (about $75) for the room. He said he'd give me a receipt in the morning. I hesitated for a second, considering the possible con, and said fine. I got two phone calls at 4:30 - one from the automated phone system, the next one from my friend the night manager. He had wanted to make sure that I hadn't slept in. When I came downstairs, he handed me an envelope with a hundred shekels and a receipt. It wasn't right, he said, to charge me for the full room rate. After all, I had only stayed for three hours, and I didn't even have breakfast. Not every good thing in the Middle East has to come through hard-fought negotiation. Even at 5:05 a.m., dawn can take you by surprise here. A dusky blue glow had already descended on this section of the planet. I needed to get a good sunrise shot as the Julians were waking (they slept outside, on Younis' rooftop -- it was cooler there). So I drove over 150 km/h down the empty desert highway to beat the sun. I knew from experience that it could suddenly pop over the horizon because it was rising from the Dead Sea-side, the lowest point on earth, up to here, a few hundred meters above sea level. Hannah Julian was already awake when I reached the Bedouin village. It's hard to get much sleep when the dogs, donkeys, sheep and roosters all gleefully take turns in rousing the humans who had not taken refuge within the hermetic seal of the modern city. The Julians are deeply religious Jews, but I got the distinct impression they were hippies before God. They reminded me of my in-laws. Hence, I took an immediate liking to them, despite the few ideological differences. Hannah happily allowed me to videotape her family as they enjoyed their last few moments of slumber. And then she joined Younis' wife as they baked Bedouin bread in an oven warmed by perpetually hot ash, buried in the dirt floor of a nearby hut. “You get up at this hour so you can make the bread and have the tea ready when the men get up,” Hannah said in a theatrical voice. It was a traditional role she was glad to experience while in Deragot she added, but she was happy she wasn't a full-time Bedouin woman. 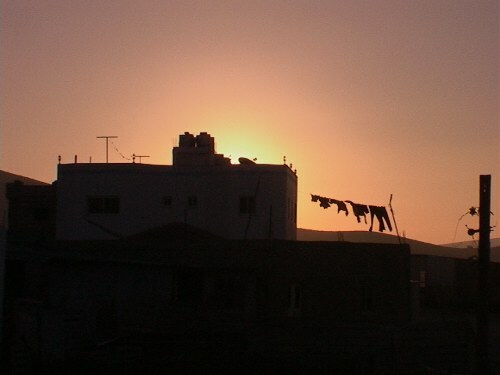 I got my sunrise shot as it hit the village rooftops and the rest of the family began to awake. Younis brought us all some strong Arab coffee, the kind with the muddy grounds that fill the bottom quarter of a tiny cup. I filmed what I needed, then sat down with my hosts to talk politics, religion, news and geography. My camera sat perched on its tripod, resting in a corner. It was only 7:30 a.m., but it had already been a good day. I certainly needed more sleep. And I felt the weariness of the grind of half a year of constant work. But here -- with Arab and Jew communing happily in the desert - I sensed that this might be an appropriate way to bring this story to a close. Now, my focus shifts west, to home. The Bedouin are renowned for their relentless wandering across the Arabian peninsula. The Jewish “diaspora” refers to the millennia-old exile of Jews from their biblical homeland as they dispersed around the globe. But the Abu Hamad tribe, 800-strong, have parked their caravans and now live in the makeshift village of Deragot, deep in the Negev desert. And last week, the Julian family of Brooklyn left their home in America for good. They took temporary refuge - in the Bedouin village. Now the four Julian children help feed the sheep. And they all sleep fitfully under the stars on a rooftop, where it's cooler at night, but noise from the dogs, donkeys and roosters often wake them. Their reward is a spectacular sunrise that bathes the barren land in golden light. The Julians were part of a mass exodus of 330 American Jews who left JFK last week on an 747 jet. They were part of an ambitious plan hatched by the American-Israeli organization Nefesh B'Nefesh (“Soul to Soul” in Hebrew) to bring at least a thousand North American Jews to Israel by the end of July. Every Jew has the automatic “right to return” to Israel. But immigration to the Jewish state has dropped since the violent Palestinian uprising began in September 2000. 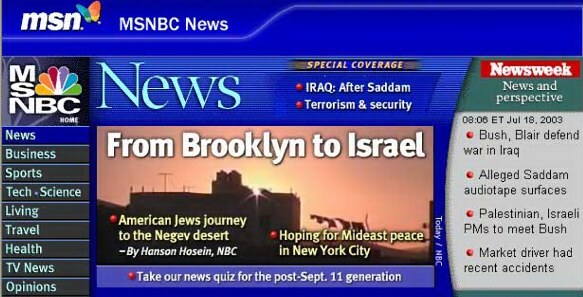 In 2002, 34,831 Jews moved to Israel, compared to the 76, 766 who did so in 1999. The immigrants are well taken care of when they arrive, and are assigned Israeli families to stay with until they can move into permanent residence. But Sinai and Hannah Juliana had other plans. And it's all because of Younis Abu Hamad, a Bedouin tour guide and the couple's friend. It was all the convincing the Julians needed. They had been planning to move to Israel for years, and they saw Abu Hamad's invitation as a sign that they should finally come. And when they did, the Bedouin insisted they stay in his house until their apartment in nearby Arad was ready. It's unusual enough that Arab and Jew should get along so well here, especially during a volatile period where a tenuous truce could erupt in violence at any time. It's even more strange that urban Americans would choose to spend their first days in a new land, living in such Spartan conditions in the desert,near the Dead Sea. However, the 185,000 Bedouin of Israel, have typically been on good terms with the Jewish state. Some have even served in the Israeli Army and are famed for their tracking skills. Yet, these Arabs have been a slow collision course with Israel, because of their land claims in the Negev. There've been a number of expropriations and evictions as the Israeli government eyes further development in the region that accounts for nearly half of the country's land mass. Deragot is an “illegal” Bedouin village according to the Israeli government. Younis Abu Hamad's family built their homes here without a permit. Which is why they don't receive any services from the state, such as running water or sewage. And they maintain a large generator that supplies the village with electricity. Still, the Bedouin don't have the same highly-charged dispute with Israel as do the Palestinians who live in the Gaza Strip and the West Bank. The Palestinians claim their own “right of return,” and are frustrated that the Israeli version has only resulted in their further displacement. The Julians may have exercised their rights under Israeli law, and immigrated with relative ease. Still, Abu Hamad says he doesn't believe he's contributing to the plight of his fellow Arabs by encouraging more Jews to come here. The tour guide added that sometimes when a hotel asks him to lead a group of Jewish tourists, they will refuse to go out with him, even when the hotel's Israeli management stands up for him. “People are afraid because I'm not a Jew,” he said. The Julians say a few of their friends wondered if they were crazy to accept Arab hospitality. Sinai does his prayers in the garden, in plain view of the rest of the village. This deeply religious family is still able to keep a kosher kitchen because Abu Hamad has given them a house to themselves. All the children play with each other, resorting often to sign language. And Bedouin modesty has a lot in common with Orthodox Jewish decorum, along with the separation between men and women who aren't married to each other. This is the kind of attitude that heartens the Israel government. Immigration is crucial to the future of Israel, whether or not the current U.S.-backed peace initiative succeeds or not. Officials worriedly point to the demographic time bomb that forecasts that sometime within the next two decades, Arabs will outnumber Jews in the area that makes up Israel, the West Bank and Gaza. And they say that threatens the viability of the Jewish state. Which is why even Israeli Prime Minister Ariel Sharon was on hand to welcome the Julians and the other American Jews when they landed at Tel Aviv's Ben Gurion Airport last week. Israelis are positively thrilled that citizens from their closest, and strongest ally, opted to leave the comfort of America to move here. There are still about a million more Jews in the United States in Israel. But Nefesh B'Nefesh says it hopes to encourage another hundred thousand to join this latest group in the next ten years. The Julians say they're excited to finally be here. Sinai hopes to teach English in the town of Arad. Hannah is a social worker, and runs a Jewish attention deficit disorder group in the U.S., so she'll have to commute between both countries for a few months. This duality also affects their children. Nonetheless, her parents say they're making an important statement by choosing to live here -- and to befriend Arabs.